A Russian Air Force observation plane entered secure airspace over Washington, DC, reportedly flying past the Pentagon and CIA before veering off to New Jersey, where Donald Trump is vacationing. US defense officials told media the jet had full clearance. Two Russian observation flights over the Washington, DC, metropolitan area – authorized under the Open Skies Treaty signed by 34 nations including the US and Russia – made headlines in the American media on Wednesday. Most outlets were particularly drawn to the fact the Russian Open Skies aircraft – converted from an old Tu-154M airliner – had allegedly been traveling at around 1,000 meters (3,700ft) over the DC metropolitan area. According to CNN, the plane “overflew the US Capitol, the Pentagon, Central Intelligence Agency and Joint Base Andrews” in Maryland. Politico and Fox News also said the jet went past Bedminster, New Jersey, where President Donald Trump is vacationing. Other spots reportedly included the Wright-Patterson airbase in Ohio as well as the Mount Weather emergency operations center in Virginia. Later in the day, Pentagon officials played down the news, saying it was a “semi-routine” flight taking place under US supervision. “I don't know of any military facilities there,” a Pentagon official who confirmed the mission, told Politico. According to the official, Russia had given the mandatory 72-hour notice before the flight. The official refused to publicly discuss the flight plans as the Russian Open Skies mission is ongoing. 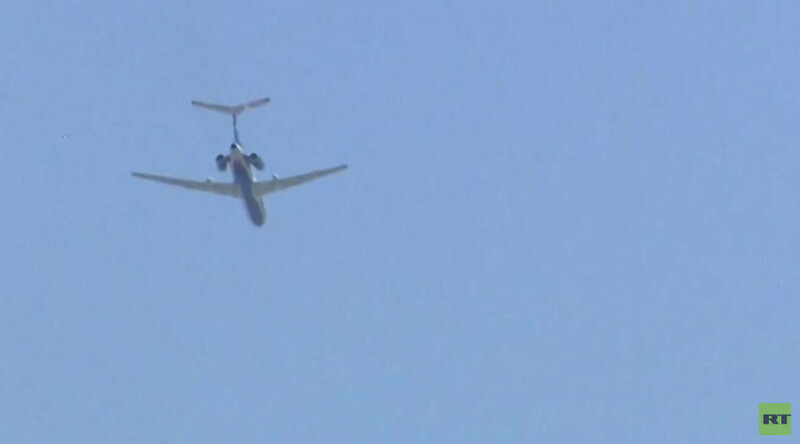 Another US official told Fox News the Tu-154M was cleared to enter so-called Temporary Flight Restriction (TFR) airspace established over Trump’s golf course. “There would have been action taken if the Russians were not allowed to be there,” said one official who chose not to be identified. “The United States is notified ahead of time of the intended flight path of observation flights, [and] participates in the development of agreed flight plans … the Treaty does not preclude an observed State Party from taking mitigation measures at sensitive sites on the ground,” the US State Department told Russia’s TASS news agency on Wednesday. Brokered by NATO and the Warsaw Pact in 1992, the Treaty on Open Skies took effect in 2002. The Open Skies covers the territory over which the parties to the treaty exercise sovereignty, including land, islands, and internal and territorial waters. The treaty stipulates that monitoring flights may only be restricted for flight safety reasons, not for reasons of national security. Normally, the flights under the treaty are conducted by unarmed observation aircraft fitted with various types of film and sensor equipment that are certified by all signatories. Russia employs a Tu-154M version, referred to as Tu-154M-ON. The Russian Air Force is planning to phase out the ageing aircraft and replace it with two Tu-214ON jets equipped with high-resolution digital cameras. As a rule, before the flights each host nation is given the flight plan of the mission and a verification team fly aboard the aircraft to make sure the crew complies with the treaty. After the flight, the host nation receives a copy of any imagery data collected by the observation aircraft.